Ever since the Protestant Revolt in the 16th century, the Catholic Church has been accused of ignoring, opposing, hiding and even destroying the Bible in order to keep it from the people. Allegedly, copies of the Bible were chained to the walls of churches during the Middle Ages so that people could not take them home to read. Supposedly the Church during the Middle Ages also refused to translate the Bible into the various tongues of the common people, the vernacular languages, in order to further hinder personal Bible reading. Furthermore it is claimed that the Church even went as far as to burn vernacular Bibles. After the 14th century when English finally became the popular language of England, vernacular Bibles were used as vehicles for heretical propaganda. John Wycliffe, a dissentient priest, translated the Bible into English. Unfortunately his secretary, John Purvey, included a heretical prologue, as noted by St. Thomas More. Later William Tyndale translated the Bible into English complete with prologue and footnotes condemning Church doctrines and teachings. In 1528, the Bishop of London wrote to Sir Thomas More, requesting that he examine the works of certain "sons of iniquity" and explain "the crafty malignity of these impious heretics" to "simpleminded people." He sent More examples of the Lutheran writers. Tyndale was not mentioned in the letter, but his New Testament must have been among the books sent to More. (1) St. Thomas More commented that searching for errors in the Tyndale Bible was similar to searching for water in the sea. Tyndale translated the term baptism into "washing;" Scripture into "writing;" Holy Ghost into "Holy Wind," Bishop into "Overseer," Priest into "Elder," Deacon into "Minister;" heresy into "choice;" martyr into "witness;" evangelist into "bearer of good news;" etc., etc. Many of his footnotes were vicious. For instance, Tyndale referred to the occupant of the Chair of Peter, as "that great idol, the whore of Babylon, the anti-Christ of Rome." Even King Henry VIII in 1531 condemned the Tyndale Bible as a corruption of Scripture. In the words of King Henry's advisors: "the translation of the Scripture corrupted by William Tyndale should be utterly expelled, rejected, and put away out of the hands of the people, and not be suffered to go abroad among his subjects." (2) Protestant Bishop Tunstall of London declared that there were upwards of 2,000 errors in Tyndale's Bible. 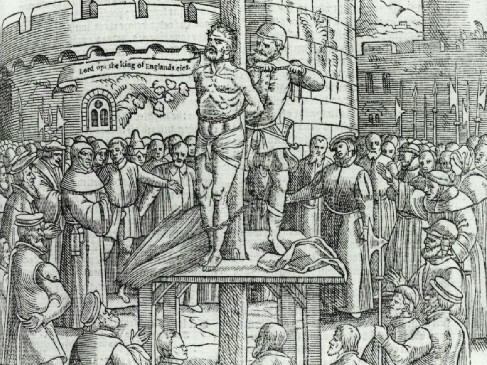 William Tyndale was executed for the charge of "heresy" by order of the Protestant King of England Henry VIII in October 1536. This wood cut is from the 1563 printing of John Foxe's "Acts and Monuments"
Tyndale, along with many Protestant-leaning scholars, resided in Antwerp, a free city, but surrounded by territory under control of Charles V, Holy Roman Emperor and a relative of Catherine of Aragon. Early in 1535. Tyndale became friends with Henry Phillips, a visiting Englishman. Phillips presented himself to Tyndale as sympathetic to the Lutheran cause, but plotted with the emperor's magistrates to arrest Tyndale. In May, 1535, Phillips invited Tyndale out to dinner and, upon leaving his residence, identified him to waiting guards who apprehended him. Although by this time, England had separated from the Catholic Church and Tyndale had some supporters in the government, the Church of England continued to fight against Lutheranism. Tyndale's friends appealed to the English government to intervene, but to no avail. After a sixteen month imprisonment, an ecclesiastical panel convicted Tyndale of heresy in August, 1536 and turned him over to the secular authority. In October of the same year he was executed, being first strangled and then burned at the stake. It is love of the God-inspired books in the Bible that caused the Catholic Church to protect the people from counterfeit translations as ardently as the State endeavors to protect the people from counterfeit currency. The "right to read the Bible," which is a moral right, does not include imbibing such a blasphemous and distorted translation as came from the contemptible ex-Catholic pen of Tyndale. His translation was ordered to be destroyed, not because it appeared in the English language, as you assume, but because it was a faulty, corrupted translation, which was a deliberate profanation of the Sacred Text. Does this action make the Church anti-Bible? First if the Church truly wanted to destroy the Bible, why did her monks work diligently through the centuries making copies of it? Before the printing press (before 1450), copies of the Bible were hand written with beauty and painstaking accuracy. One reason for Bibles being chained to the walls of churches is because each copy was precious both spiritually and materially. It took a monk about a year to hand copy the entire Bible, so Bibles were scarce. Paper was not used during the Middle Ages, as the first paper mill was not built until the 15th century (in England). Every monastery had a scriptorium, a writing room, in those ages, where priests and monks diligently and lovingly transcribed Bibles. In that way the texts we have today were preserved. It is calculated to have taken 427 skins or parchments. It has been estimated that in 1518 the cost of a copy of the Bible wold work out at the 1952 rate of L218 (or about $1000),for material upon which to write a single Bible(4). Hence Bibles could not be distributed then as they are distributed today. Those chained Bibles were Open Bibles. The people who could not afford to own a Bible stood at a desk, lectern or stall in the aisles and corridors of the Catholic Churches during those Middle Ages, for there were no Protestant Churches in those days, and read those valuable open chained Bibles, to their hearts’ content. Thus we see, that chained Bibles were Bibles used for educational purposes. the Protestant misconception, gleaned no doubt from anti-Catholic sources, is as unreasonable as to conclude that telephone books, city directories and dictionaries are fastened to telephone booths, druggist counters and library tables in order to keep people ignorant of the numbers, addresses, and definitions in them. What the Church did oppose were heretical additions and distortions to the Bible. 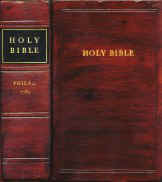 The Church prohibited these corrupt Bibles in order to preserve the integrity of Holy Scripture. This action was necessary if the Church is to preserve the truth of Christ's Gospel. As St. Peter in his Epistle (in the Bible) warns us, the ignorant and unstable can distort the Scriptures to their own destruction [2 Peter 3:16; see front panel]. Several times The Anglicans themselves burned Copies of the King James Version, a example of this was the 1631 printing somtimes know as the "Wicked Bible" because of a error made by the Printer Robert Barker. The word "not" was left out of the 7th commandment say it said "Thou shalt commit adultery". England's King Charles I [a Anglican] was not amused by the mistake. He ordered the Bibles recalled and destroyed, took away Barker's license to print Bibles and fined him 300 pounds([a lifetimes wages in those days]. Barker was out of business. By order of the King almost 1000 Bibles was put to the torch, only 11 of this printing are left today. The Title Page of The 1782 Aitken's edition of the Bible. There were even stipulations on the printing of sacred scripture, it was illegal in Anglican England or the American colonies to print the Bible in English. The Crown claimed a copyright on king James version, and printing of that version was a privilege accorded exclusively to the King’s printers and the universities of Oxford in Cambridge. Hence its published in English colonies appeared in languages other than English. It was not until after the outbreak of the American revolution that American presses began to publish the King James Bible. First came Robert Aitken’s edition of the new Testament printed in Philadelphia in 1777 against great odds. Not only was the work done on poor equipment, but on one occasion Aitken had to save his type and printing materials from destruction by the English red coats by sprinting them out-of-town and hiding them under a barn (19). The Anabaptists In 1534, seized control of Münster Germany calling it The "New Jerusalem" they embarked a reign of terror and indescribable orgies, communism and polygamy. Many Catholic and Lutheran Bibles, treasures of literature and art were burned in great fires held in the town squar. The Anabaptists atrocities came to a end on June 24, 1535 with a joint Catholic and Lutherans siege and capture of the town of Münster. (2) Where We Got The Bible © 1977 p. 128-130.